She is known as Driftcat Catherine is the first professional female driver in the Australian contingent. It all started in 1992 when her mother took her to the local go-kart track, she saw a sign on the wall saying ( fastest female lap time) and she was more motivated than ever to beat that time. She finished top 3 in a couple of friendly go -kart races but then she became interested in another sport. Catherine interest in motocross grew at a point that she begged her mother for a bike and on Christmas Catherine's wish came true. She started to take part in Club races and she did very well in the 80cc juniors C-class were she achieved good results. 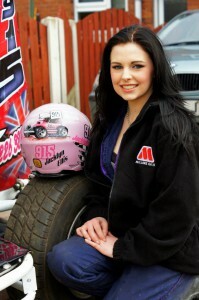 At around 18 years of age she showed particular passion and enthusiasm for cars. She started taking part in quarter mile drags, burnout competitions, circuit racing but none of them gave her that adrenaline rush that she felt when taking part in motorcross events. After an invite from her friends to take part in a drifting event she realized that its the sport that she was craving for. In 2004 she made it a point to do everything on her own. She packed the trailer, worked on her car, towed the car to events around Australia, slept in her car on the side of the road because of the fatigue nd the fact she couldn't afford accommodation at the time. After all these sacrifices she won her first 2004 Calder Park Night competition and made it among the Top 4 in Queensland Powercruise in a borrowed Nissan Onevia (Sivlia S13). It wasn't long until she was chosen to join Team Hybrid and used her Nissan. At Kyalami race in November 2007, Clare Vale became the first lady driver to race in the premier National Wesbank V8 Supercar series. In March of 2009 at the Wesbank V8 race at Kyalami, she obtained good results that she took pole and as well as lead at a V8 race. She later on moved to the drifting motorsport scene, becoming the first female driver to participate in the Supadrift Series, South Africa. Clare chose of car is a Mustang powered 600bhp. These engines makes V8 supercars the fastest cars in the country and Clare's drift mustang is powered by the same engine making it unique in the South African drifting. From an early age Jacklyn used to attend the garage with her dad. She was very to keen to learn so at a tender age of 6 she learnt how to weld and change her first drive shaft at 7 years as well as learning how to use her dad's recovery truck. The girl was showing a lot of potential and determination for the car culture. At the age of 13 Jacklyn bought a scrap Mini from ebay and she started to butcher and rebuild it. Hard work pays off cause after 7 months she built her first stockcar while keeping up with school stuff as well. She competed in this Mini championship were she had ups and downs but managed to win her first championship. At the age of 16 she upgraded to F2 stockcars. It wasn't easy for her to adjust to drive rear wheel drive stockcar .She is a very promising driver that in the future we will hear more about her.